يقع في Yering, The Gatehouse at Villa Raedward إنه المكان الأنسب لاكتشاف يارا فالى و ما يحيطها. يقع مركز المدينة على بعد 35. Km فقط. ويمكن الوصول إلى المطار خلال 55 دقيقة. يوفر الفندق بفضل موقعة الجيد وصولاً سهلاً إلى أهم معالم المدينة.
. يعمل The Gatehouse at Villa Raedward على ضمان إقامة مريحة لضيوفه من خلال خدماته الممتازة وحسن ضيافته. لضمان راحة ضيوفه، يقدم الفندق الخدمات التالية: واي فاي مجاني في جميع الغرف, خدمة التنظيف يوميًا, مطبخ, واي فاي في المناطق العامة, صف السيارات . يمكن للنزلاء الاختيار من ضمن مجموعة من الغرف المصممة بعناية لتعكس جواً من الراحة، والتي يتجاوز عددها 2. يمكنك الاستمتاع بالأجواء المريحة التي تقدمها مسار جولف - ضمن 3 كم, سبا, تدليك, حديقة طوال النهار. استمتع بخدمات لا يعلى عليها وعنوان ذو اعتبار في The Gatehouse at Villa Raedward . 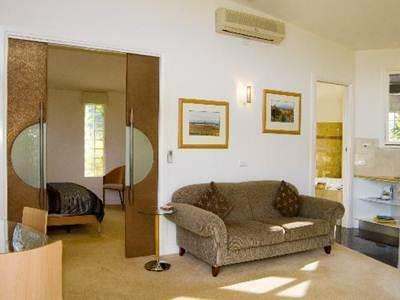 The Melba suite is very spacious and comfortable with a lovely view of the garden from the lounge and patio. We would highly recommend The Gatehouse to future patrons. The owners are very welcoming and knowledgeable of the Yarra Valley area. We had such an amazing experience there of pure luxury and seclusion. The spa was amazing, the breakfast food provided for you to cook yourself was local, fresh and beautiful to eat in your private garden outside. It was an amazing place to spend the first night of our engagement! Everything about this accommodation was 1st class and attention to detail, second to none. John the host, is an absolute gentleman. 1) Beautiful Estate. 2) Self Contained Facility. 3) Great Location. My wife and I love the estate. It is very well maintained. The owner was friendly, responsive and helpful without being intrusive. Breakfast was generous and good variety over three days. Negatives were poor wifi connection and the small uncomfortable bed. Loved our stay, everything was just perfect. A welcome base for our Yarra Valley activities, keep wishing we were still there! A really lovely stay. The hosts were lovely (and unobtrusive). the fridge was full of a whole range of brekky items to tempt anybody. The spa was good too. The villa was in a great location nearby a bunch of vineyards in Yarra Valley and only 45 mins from Melbourne. The owner took great care of us with suggestions on vineyards, restaurants and the best bits of Yarra while also stocking the fridge each day with different brekkie options from bacon and sausages through to muffins and pastries. Very friendly but not intruding. The villa itself is very spacious and clean with lovely views across a kind of Tuscan-esque garden. Would definitely recommend for anyone going for a weekend to Yarra Valley to explore the wine. My family and I had a wonderful stay here. Only a short drive from Yara Glen which is a nice town (although give the local chinese a miss). Close to many wineries and the Wildlife Sanctuary for the kids. A couple of friendly neighbouring horses also kept the kids busy. The breakfast supplies are amazing. Plenty of choice plus a complimentary bottle of sparkling and some port. I would definately recommend a stay here. was terrific, he explained the features of the suite and how to use them. there are little extras like biscuits and chocolates that are replenished the next day as we stayed 2 nights. the dishwasher was even emptied when we got back to the suite. very relaxing and enjoyable stay. We thoroughly enjoyed our stay, after we decided to try somewhere new to stay in the Yarra. The location was perfect, dab in the middle of all the wineries. We totally relaxed with the latest dvd's, many magazines, the supplied local sparkling white and the spa. The provisions were ample and restocked daily - juices, twinnings, coffee, chocolate, bacon, organic eggs, tomatoes, mushrooms, chicken sausages, baked beans, yoghurt, fruit, and the list goes on. Our host John was really very generous and we will definitely be back. We had fluffy robes, slippers, beautiful molton brown amenities supplied - even an electric blanket and heated towel rack! Thank you for a lovely weekend, you've stolen our business from Balgownie Estate! 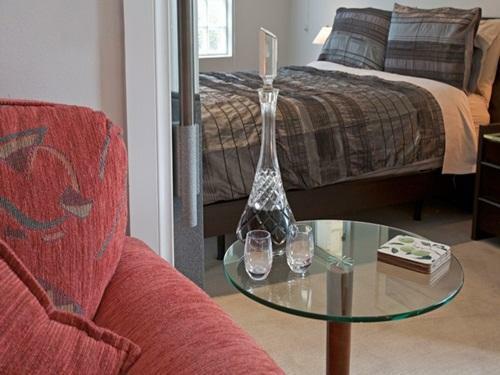 Excellent accommodation in the heart of the Yarra Valley, just minutes from wineries and Yarra Glen/Coldstream. John was a great host and was very understanding when there was a problem with our booking through Agoda. Would definitely recommend this place for couples!